When Kathryn and Doug Collins moved to Corvallis from northern California with their 10-year-old son, Jeff, they did so with his future in mind. They wanted Jeff, who is on the autism spectrum and experiences intellectual and developmental disabilities, to grow up in a community that would support his growth as a child and his success as an adult. For the Collinses, one gateway was IMPACT, which they learned about from an elementary special education teacher. “It was a way for us and for Jeff to meet people in a new community, and it was one of the few activities outside of school where he could play with others,” Kathryn says. It also meant an hour and a half of respite for she and Doug while Jeff played games and swam – and occasionally a chance to talk with parents and experts about ways to support their son and children like him. When Jeff was 18, he transitioned to exercising at Dixon Recreation Center with IMPACT, which introduced him to the world of fitness he would enter as an adult, and also made room for children on IMPACT’s long wait list to be part of the program at Oregon State’s Women’s Building. When he aged out of IMPACT at 21, he joined a local fitness center within walking distance of his home and where he continues to exercise there regularly. 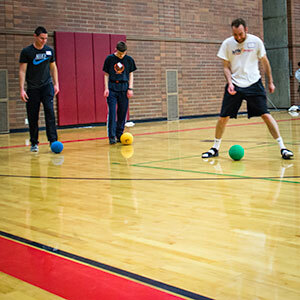 Today, those 21 and older move into IMPACT for Life to ease the transition from IMPACT to exercising more independently. Whether that’s at a local gym, park or aquatic center, IMPACT for Life pairs these young people with a mentor to help further their fitness goals and keep them physically active within their community. Doing so, Kathryn says, allows peers to help with this transition instead of parents, which offers many advantages. 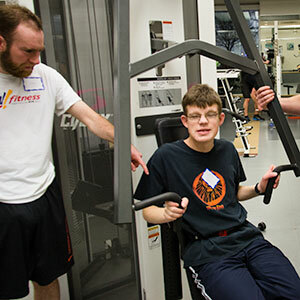 About 13 years ago, Jeff himself became a mentor, and at 33, he shares his love of fitness with an 18-year-old IMPACT participant and friend at Dixon. In addition, he works six mornings each week at a local golf course, which he has done since high school, goes to a gym nearly every day, has friends all over town and lives on his own. And in 2012, this young man, who as a child struggled with spoken language, addressed members of the National Council on Disabilities in Salem, Ore., and Washington, D.C., about abolishing the sub-minimum wage for people with disabilities.